BALTIMORE, M.D. 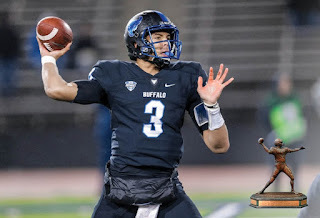 -- The Johnny Unitas Golden Arm Award® presented by A. O. Smith has narrowed its 2018 season watch list to 30 and University at Buffalo signal-caller Tyree Jackson has made the cut. The award is given out annually to the country's top college quarterback. Jackson, who has helped lead the Bulls to a 4-1 start, has thrown for 1,204 yards and 16 touchdowns on the season. He leads the MAC and is tied for fifth in the nation in touchdown passes. The junior quarterback is also on the watch list for Davey O'Brien National Quarterback Award. Jackson is one of just two quarterbacks on the 30-man list from the Mid-American Conference. Candidates must be a college senior or fourth-year junior on schedule to graduate with their class. Criteria to be considered for the award include character, citizenship, scholastic achievement, leadership qualities and athletic accomplishments. It was recently announced that A. O. Smith will be presenting the 2018 Johnny Unitas Golden Arm Award®, which will be hosted on December 7 at the Embassy Suites Baltimore Inner Harbor Hotel & The Grand. Proceeds from the event help support the Johnny Unitas Golden Arm Educational Foundation, which provides assistance to underprivileged and deserving student-athletes throughout Maryland and Kentucky. "A. O. Smith has a legacy of innovation and performance in the water heating and water treatment industries, much like Johnny Unitas did on the football field," said Jeff Storie, A. O. Smith's director of marketing. "Both of these iconic names have been around for decades and share many of each other's values. For A. O. Smith, partnering with the Johnny Unitas Golden Arm Educational Foundation and the Golden Arm Award makes perfect sense. We're excited to tie our own efforts to further education in our trade with the Foundation's efforts to help further the education of youths interested in football around the country." Click here for the complete watch list.